Visit over a dozen countries on one sunny island! It really is like visiting over a dozen cultures and countries in one (sunny) place! In these tricky economic times, it pays to plan your holiday in a vacation spot that offers something different — plus plenty of sunshine and some great beaches. That's not just a cliché. Sicily is the other Italy. Our heritage is European, Asian and African. The island in the sun boasts almost as many ancient Greek temples as mainland Greece — several so well-preserved that they might have been built yesterday — and some of the world's best-conserved Byzantine art and architecture. There are imposing signs of medieval Arab and Norman civilization, not to mention Baroque marvels that rival those of Spain and mainland Italy. All reflect the legacy of the peoples of Sicily — the world's most conquered island. And then there's the cuisine, a delicious result of these cosmopolitan influences. Your taste of Sicily will be unforgettable. The word multicultural seems as if it were coined to describe the diversity of Sicily's history. Our Sights and Top 12 pages are a good place to begin, but on this one we would like to explain precisely what we're talking about, with an emphasis on the sights and sites you can visit. Of course, Sicily's splendid scenery and geography are not to be overlooked, and the following map (among many others on this site) will help you find your way. • The First Sicilians: With the exception of a few Greek trading settlements on the coasts, Sicily was the domain of three distinct civilizations until circa 800 BC (BCE). The Elymians and Sicels arrived a few centuries earlier. The natives were the Sicanians, whose ancestors colonized Malta, where they built Europe's oldest temples. In Sicily, a Sicanian temple stands atop the rocky mountain overlooking Cefalù. • The Punic Peoples: The seafaring people who invented the alphabet and traded as far as Britain were nautical masters of the Mediterranean, leaving traces of Egyptian art in Sicily. Palermo, Solunto and Motia (near Marsala) have Phoenician walls, and so does Erice – though ancient Eryx began as an Elymian city. By around 400 BC (BCE), the Carthaginians had inherited the Phoenician territories of the central and western Mediterranean. • The Greeks: Their culture largely supplanted that of the Punics in the eastern Mediterranean and then Sicily. Segesta was an Elymian city that readily assimilated Greek culture, and there are also standing Greek temples at Selinunte, Agrigento and Segesta, with small amphitheatres and archaeological sites around Sicily. In Syracuse, the most important of the Greeks' Sicilian cities, the cathedral was built around a large Greek temple whose columns are still very evident. Sicily eventually became Rome's first foreign province (and with the Punic wars fought here the Carthaginians were finally defeated) but Greek – not Latin – remained the island's principal language into the Early Middle Ages. • The Romans: Rooted in Etruscan and Latin origins, Roman culture readily assimilated that of the Greeks. Sicily has a few "purely Roman" monuments, such as those in central Catania, and a number of ground-level archeological sites like Palermo's. But things like Taormina's Roman walls and theatre (built around an earlier Greek amphitheatre) are the rule – though Syracuse has an oval Roman theatre in addition to its larger, semi-circular Greek amphitheatre. Piazza Armerina's Roman villa, with its stunning mosaics, is the largest, best-preserved residence of its kind in the Roman World. With Rome's fall during the fifth century AD (CE), Sicily looked to the East. • The Byzantines: Interesting though the Goths and Vandals may have been, they left few tangible traces in Sicily during several decades of rule. Following Rome's fall, Greek culture, with Byzantium (now Istanbul), as its point of reference, flourished here. Its influences are most evident in the icons created ("written") in mosaic. In Taormina there's one in an archway in a main street, and of course the cathedrals of Monreale and Cefalù are famous examples. Byzantine culture was closely linked to the Greek (Orthodox) Church. The cathedral of Syracuse is the classic example of a Greek temple converted into an early (Paleo-Christian) church, and that city's mikveh (Jewish ritual bath) was carved into limestone during the Byzantine period. A must-see is Palermo's Martorana, built as a Greek Orthodox church. • The Arabs: By definition, speakers of Arabic were Arabs, but the Muslim peoples arriving in Sicily during the ninth century included Berbers and others. Few visible traces remain of the purely Khalbid and Fatimid cultures of Sicily except in museums – inscriptions in stone and paper documents. The Koranic suras inscribed in several pillars in Palermo – one supporting the cathedral's portico – are the exceptions. There are also some underground channels (kanats). More evident are churches and palaces in the Norman-Arab style, some (like Monreale Abbey) incorporating Byzantine features. Of special note, as regards purely Arab art, is the ceiling of the Palatine Chapel. 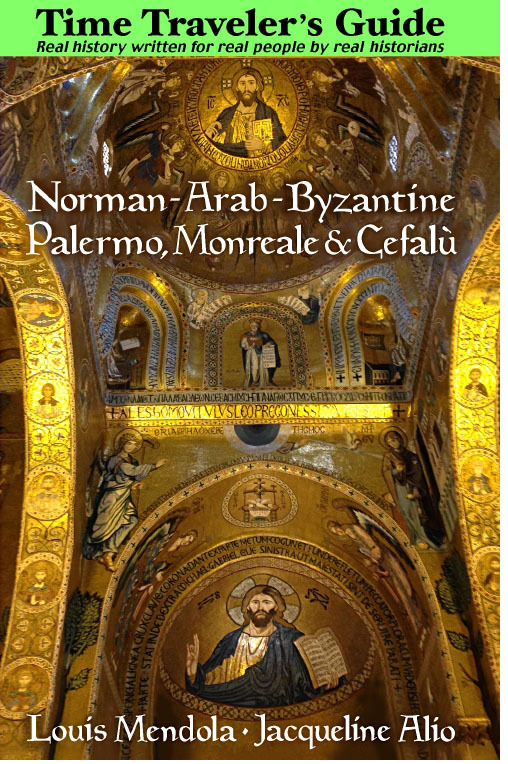 • The Normans: When the Normans arrived in Sicily in 1061, a few years before their conquest of England, they found what seemed to be two populations living side-by-side, namely Arabs and Greeks. There was also a small but prosperous Jewish population seeded among the other two. Whatever the rapport of the Normans with the Saxons they found in England, in Sicily there was (at least initially) accomodation of the pre-existing populace, and Sicilian-Norman culture reflected this. With a few exceptions (such as Cefalù Cathedral's nave and the subtle Provençal touches in Monreale's cloister), Norman architecture in Sicily is a Romanesque style – rather than the pure Gothic – which developed in synergy with Islamic and Byzantine movements. In Palermo (Cathedral, Palatine Chapel, Zisa), Monreale (the cathedral complex) and Cefalù (the cathedral) can be seen the greatest examples. Some of Sicily's castles also date from this era, when feudalism was introduced. • The Swabians, Angevins and Aragonese: By 1200, the island's cultural influences were becoming increasingly Western. Most Christians were now Latins (Roman Catholic) and Islam was disappearing through conversion. Cosmopolitan he may have been, yet Frederick II was solidly European politically. Signs of medieval German, French and Aragonese (northeastern Spanish) influences abound in Sicily. The Italian Romanesque-Gothic, Catalonian Gothic and Swabian Gothic styles of many churches, castles and palaces built between circa 1300 and 1500 are typical. And, of course, there's the heart of Saint Louis in Monreale's cathedral. • The Spanish: Perhaps the greatest legacy of the Spanish period, from 1500 to 1700, is the ubiquitous Baroque present in virtually every Sicilian locality. While a Sicilian Baroque developed after 1700, to be seen in Catania, Noto and Ragusa, most of Sicily's churches and palaces were constructed in an ornate Spanish style vaguely influenced by Italian movements. Lovers of the true Gothic (a movement very rare in Sicily) often find the Baroque and Rococo rather ugly, but Baroque fanatics abound. • The Albanians: Arriving as refugees around 1500, the Albanians established or repopulated several communities – Piana degli Albanesi, Contessa Entellina, Mezzojuso and others – where they re-introduced the Eastern Orthodox faith. These towns, and Palermo's Martorana Church (built for the Greek community in the twelfth century), are well-known for their religious festivals, especially around Easter. • The Jews of Sicily: The Inquisition dissolved Sicily's Jewish communities in 1493 – the island was then ruled by Spain – and many Jews left while some converted to Catholicism. Their visible traces are rather few, but the mikveh of Siracusa, in that city's Jewish Quarter, is the oldest such structure known to exist in Europe. • Italian Sicily: There exists a Sicilian language with roots in the twelfth century, but what you'll hear most is Italian. Sicily has been part of Italy since 1861. For seven centuries before that it was a sovereign kingdom, though for a few hundred years it was ruled from afar by distant monarchs in Madrid and Naples. If you scratch its surface, Italy itself might be said to be an eclectic mix of cultures. Virtually everything created in Sicily since 1861 is "Italian" – the great opera houses of Palermo and Catania come to mind.